Experts in the Not for Profit sector have voiced concerns over reports that children with disabilities could soon be catching Uber-style transport to school. It comes after The Australian reported on Monday that it had seen leaked documents from the NDIA detailing a proposal that could replace the specialist school bus system in Victoria and Tasmania under the guise of a more “efficient” market. The article stated a $600,000 trial was being workshopped by the National Disability Insurance Scheme and the University of Melbourne’s Centre for Market Design, with the support of the federal and ­Victorian treasuries, to try to ­develop a “smart market” to ­replace a “one size fits all” bus ­system. People with Disability Australia president Craig Wallace said he could understand the need for a more integrated system but he was cautious about the idea. “First thing I would say is I recognise there may be a case for reform in the current arrangements for taking children with disability to school,” Wallace told Pro Bono Australia News. “We receive regular reports that some children have very long journeys to school, up to two hours, because special schools, which we do not support, generally have very wide catchments. The current system, which ­includes a driver and a supervisor for the students on board, has been in place in Victoria and Tasman­ia for decades. But the paper, seen by The Australian, argued the system does not allow choice and control for families and their children. They are planning to involve community transport providers, non-emergency medical transport, taxis and share-ride or carpooling options in the smart market for student transport. This has prompted concerns over the safety and wellbeing of the children. Wallace said it was vital they have safeguards in place in trials involving children who may have multiple vulnerabilities, having any contact with private carpooling or ridesharing arrangements. “We would certainly want safeguards in place for vulnerable children travelling on long ridesharing arrangements with private individuals,” Wallace said. “I would want to make sure those people did have the adequate training, disability supports and that we weren’t exposing vulnerable people to abuse. Wallace also said he was “very wary” about creating a parallel system for disabled children and that the preference would be, “as far as is possible” for children with disability to be travelling to school in the same way as other children. 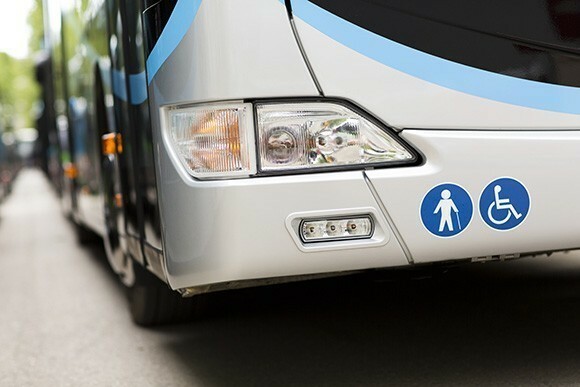 “We believe that the overwhelming focus needs to be on disability supports within accessible buses in the mainstream fleet so that children with disability can travel to school like other children do,” Wallace said. “Currently school buses are exempt from the DDA [Disability Discrimination Act] standards. According to The Australian, the Victorian government spent $70 million to transport more than 8,000 students with disabilities to special schools last year. The decision to include school transport under the NDIS was agreed on between all states and the then federal Labor government just 10 weeks before the first trials were to begin in 2013. “They currently spend $70 million to transport kids to school, so a reform of the system that is going to be safer and better and going to get kids to school in a more direct way, then maybe that is a worthwhile investment,” Wallace said. When referring to Uber, Wallace said there were other issues to consider. “Uber don’t have an encouraging record on disability transport anywhere,” Wallace said. “They have reduced the number of wheelchair accessible vehicles on the road in Melbourne and San Francisco and they have no pathway for obtaining wheelchair accessible vehicles here in Canberra. “So we have some concerns about those models more broadly. According to The Australian, the university will have a lab test of the new market ready by the end of the year with live ­pilots planned next year, in which families would go online to spec­ify their user requirements. Companies, in return, would bid for those accounts after nomin­ating the bare minimum they would need to be paid to ­remain viable. Pro Bono Australia News attempted to contact the University of Melbourne’s Centre for Market Design for comment. This article was originally published on Pro Bono Australia. You can see the original article here.